For a Sunday (morning) treat, we enjoyed this dip made with edamame, roasted garlic, herb chevre, scallions, parsley and lemon juice. Red bell pepper, cucumber, and both toasted and untoasted baguette slices were used to enjoy the goodness. Preheat oven to 350 degrees. Place garlic on a piece of alluminum foil and drizzle with olive oil. Toss to coat. Wrap loosely in the alluminum foil and bake at 350 degrees for 50 minutes to 1 hour, or until the garlic is roasted. While the garlic roasts, roughly chop the scallions and parsley. Bring a large pot of water to a boil over high heat, then salt the water liberally. Once the water has returned to a boil, add the frozen edamame. Boil the edamame for 5-7 minutes until tender. Strain the edamame, reserving a cup of the liquid. Add the edamame, roasted garlic, parsley, scallions, lemon juice, and 1/4 cup of the reserved liquid to a food processor and process on high until the ingredients are smooth. Add the chevre and 2 tbsp heavy cream, and process thoroughly. If the dip is too dense thin it out with a little more of the reserved liquid and pulse again. Taste the dip and adjust seasoning to taste with salt and black pepper. Chill the dip or serve it at room temperature with baguette, red bell pepper, carrot, and cucumber slices. Enjoy! Sounds really good, and a great party idea when you need to get rid of half a case of edamame taking up space in the freezer. Maybe I’ll make it and add some chickpeas, or toasted almond butter, more things in the pantry/refrig that need to be used up. I may make some this week, or take a nap instead…..
Oh, that looks really good! Edamame is one of the relatively few fellows in the bean family that I love, and once I manage to get ahold of them here in Sweden, I’ll try this out! bobby, i didn’t think about all the foods you got stuck with when harvest closed! i imagine you guys could survive off freezer food for quite some time. I just ate my second serving of the dip for dinner and my it was quite tasty. definately good for parties…if you have friends. which we don’t 😛 so it’s good for a sunday morning too. we had to just decide to run with posting something – even if we didn’t have time for a normal post. hmmm…. naaaap….. Thanks Anne! it was really quite tasty. i love edamame too, and you can’t beat the health benefits. And you get all the yummy flavor of goat cheese. ooooohhhh yeah! if you get a chance to try it, let me know what you think! I don’t think I’ve had edamame before. If I see it, it’s usually in the veggie option in Japanese restaurants and I’m too busy tucking into the raw fish to try it. From what everyone here’s saying, it sounds delicious…I’ll make a point of trying it soon. Wow what a great recipe Amanda! Happy Halloween! I forgot to say that I love the photo too! Ahhhh I swear that chook and mango…!! Dip looks and sounds great! That is such a neat idea. 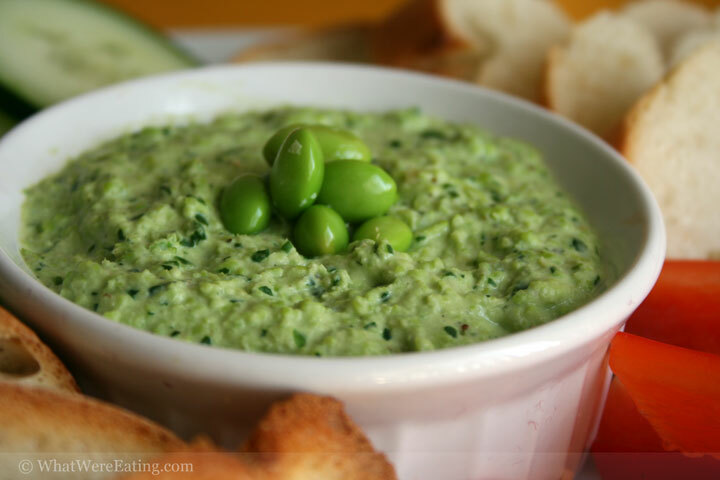 I have seen edamame humus before but it sounds way boring next to chevre and 15 garlic cloves. Ros, edemame is very refreshing to me. it tastes healthy, but good healthy can be tasty! right? aria… a croissant? for me… and the dip? please!?! it’s ashame we can’t shove food through the cables and direct it to a specific place. i’d trade you some dip for some of a croissant! Thanks Lucas! i’m glad you enjoyed yourself tell if you make anything and how it comes out! I’m making this dip right now, and it tastes pretty good, but it’s incredibly stringy. Was I supposed to use edamame in the pods, or remove the beans first? Did you have this problem?